To get to the Edit View click on the name of the entry or on the page icon. You have the possibility to edit the contents with or without a WYSIWYG editor. The setting is global and covers all contents. 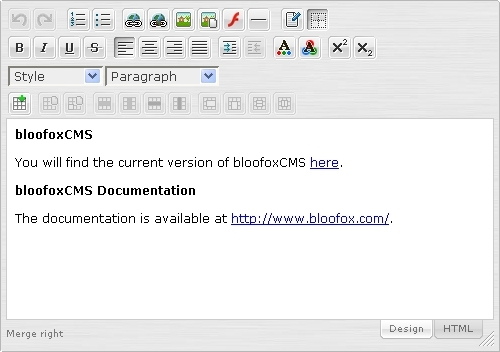 bloofoxCMS uses Spaw editor by Solmetra (www.solmetra.com). With this editor you may create many different kinds of contents. It is delivered by an intuitive user interface like in text processing software. It is not installed by default. Read Plugins -> WYSIWYG editor to find out how to install Spaw editor as a plugin. For each content you create you can insert a separate title. For your text you can choose the text align and the color of your font. If you don't want to change it just leave it on the default value. Next to the text box you can see all pictures of the media center. These pictures can be inserted with short tags or html code.